This is the rack of “mass market” paperbacks that I see when I stand in the queue, every time I go to my local supermarket. I finally had a closer look at the titles last week. What could people be reading? I wondered. Are these books total dreck, cheap, small and nasty and the kind you can leave behind on the bus, train or plane? If they are there, they must be selling well. But why? So, I checked it out. If, like me, you were ever either snooty about these books (Oh, I’m a better reader/writer than that! ), or about to get a mass market publishing deal, read on. Since her first book in 1973, Danielle Fernandes Dominique Schuelein-Steel (71 years old) has written 165 books, including 141 novels, mostly romances. She is the best-selling author alive and the fourth bestselling fiction author of all time, with over 800 million copies sold. All her novels have been bestsellers, including those issued in hardback. Since her first book in 1983, Debbie Macomber (70 years old) has written 180 novels (comprising 106 novels in series, and 74 standalone novels) and 10 non-fiction books, mainly romance novels and feel-good contemporary women’s fiction about relationships. She is a #1 New York Times bestselling author and more than 200 million copies of her books in print worldwide (verified book sales not available). Since his first book in 1992, Michael Connelly (aged 62) has written 32 novels, mostly crime and detective novels. Over 60 million copies of his books have been sold worldwide, and his books have been translated into 40 foreign languages. Since 1981, Nora Roberts, born Eleanor Marie Robertson (now 68), has written more than 320 (!) romance, crime and Science Fiction novels. Her work has been plagiarized a few times by other romance writers. She writes under the names Nora Roberts, J.D. Robb, Jill March and Sarah Hardesty. Since 1999, every one of Roberts’s novels has been a New York Times bestseller, and 124 of her novels have ranked on the Times bestseller list, including 29 that debuted in the number-one spot. According to her website, over the last 30 years, an average of 27 Nora Roberts books were sold every minute. Her novels have been published in 35 countries. Since 1993, Lisa Scottoline, aged 63, has written 40 novels and 10 non-fiction works. Over 30 million copies of her books are in print and are published in more than 35 countries, in 30 languages. Since 1993, James Brendan Patterson (aged 71) has written 129 novels, mostly crime thrillers but also romance. Some of these were co-written with other authors. He has written 6 non-fiction works, and 56 books for children and teens, which brings the total for fiction to 185. His books have sold more than 300 million copies and he was the first person to sell 1 million e-books. In 2016, Patterson topped Forbes’s list of highest-paid authors for the third consecutive year, with an income of $95 million. His total income over a decade is estimated at $700 million. There you have it: long-living, dedicated, professional and rich authors. They have had decades to hone their skills and write exactly what appeals to their readers. And that they are successful is testament to their skills and the resulting dedicated pool of readers they have all around the world. It also demonstrates that it helps to have your books translated from English, and to have them made into films. It speaks to the plain fact that writing is a job – an unglamorous, hard job. These books are in the category of publications known as “mass-market originals” or “mass-market paperbacks”. They are the ones you see in eye-level racks at your local supermarket, at the checkout counter, along with the odds-and-ends household “decorations”, headache tablets, chewing gum, breath mints, batteries, chocolates, and gift cards. You’re standing in a queue, waiting for your turn, patient and bored, and your eye happens to fall any of this stuff and you put it into your trolley/shopping cart and Bob’s your uncle, as they say. 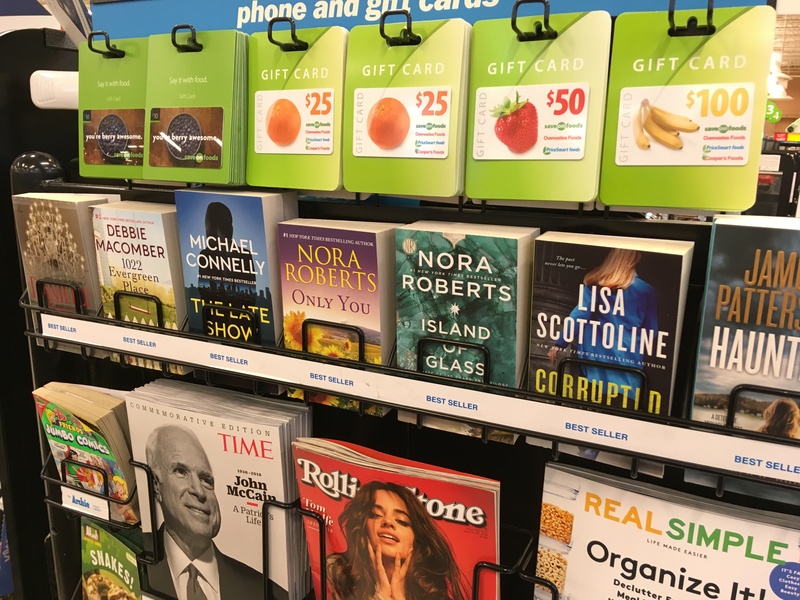 Mass-market books are especially designed to fit into the racks set near the checkout counter at supermarkets, hospital gift shops and airport newsstands – in other words, where people are passing through and do not have time to pick a book by reading the blurbs on the back. Usually, people in these places are distracted by other concerns and pick the book because of the authors or the catchy one-to-three words titles. The writing must be immediately gripping and appealing. Therefore, many of these authors specialize in writing about easily recognizable family situations and relationships. They are priced affordably so they can be bought on impulse, and they are smaller and printed on cheaper paper than other paperbacks, so that they can be tucked into a back pocket or bag and discarded. And they are printed in vast quantities and have distribution to match. What do mass market authors have in common? The Forbes list is based on data by NPD Bookscan, for income of one year, from June 1, 2016, through May 21, 2017, before taxes and other fees.) Of course there are many dead authors, and authors who do not write in English, who have also amassed fortunes. Paulo Coelho: The Alchemist of Words documentary (2001) on YouTube. For instance Paulo Coelho, the Brazilian novelist, apparently has a net worth of $500 million. María del Socorro Tellado López (born April 25, 1927 in El Franco, Asturias, Spain, died April 11, 2009), known as Corín Tellado, was a prolific Spanish writer of romantic novels and photo-novels that were best-sellers in several Spanish-language countries. In her lifetime, she published more than 5,000 titles (my goodness!) and sold more than 400 million books which have been translated into several languages. María del Socorro Tellado López with her books. What does this say about the books on the rack at the supermarket? For one, there’s nothing about them that you can turn your nose up at. These are the products of lifetimes of dedication of authors to their craft. Secondly, readers owe the big retailers, like Walmart, Costco, Save On, and Target a debt of thanks. They get more books to more readers in more places than any other book store. They sell more mass market books than Amazon does. Who would’ve thought, hey? There’s a story behind everything, even the paperbacks at the checkout-counter at the supermarket.